looked at a coqui frog caught in Wahiawa Heights last week. As night falls, the sound of male frogs whistling to attract females pierces the quiet of a Wahiawa neighborhood. For Wahiawa resident Gail Souza, the mating call of the coqui or Caribbean tree frog was maddening when it began a year and a half ago. "It keeps you up all night from sunset to sunrise, constant peeping," said Souza, who thought it was the neighbors' bird, until they moved. "We ended up going to sleep with the T.V. on," she said. So once a week, a band of frog hunting volunteers tromps through the steep gullies and backyards of Wahiawa in the darkness straining their ears to pinpoint the precise branch or leaf to which the singing males cling. After zeroing in on the sound, a frog hunter shines his flashlight at the foliage. Once he spots the critter, he grabs the moist, gray-brown frog barehanded and pops him into a plastic container. The frogs have gained a foothold in Wahiawa, where 51 singing males have been captured in the last two months, said U.S. Fish and Wildlife Leila Gibson, who coordinates state and federal agency efforts in catching and monitoring them. She estimates there are a dozen or so males still in the area. The coqui frog (Eleutherodactylus coqui) population has been in Hawaii since 1988, but "just recently exploded," said Milton Matayoshi, of the state Department of Agriculture. "They may have started from a nursery, gotten into the wild, then both populations built up." 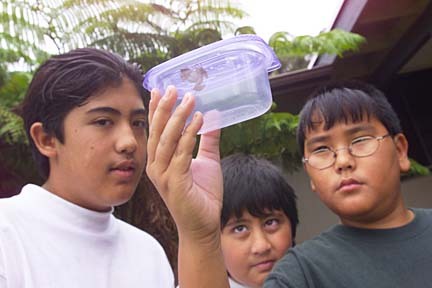 Thousands of the creatures measuring a half inch to 2 inches plague the Big Island and Maui. They have also begun to invade Oahu and Kauai. A single male frog's two-toned love call may not be all that unpleasant. But a dense population can sound like a treeful of squawking mynah birds that go on all night, Matayoshi said. Biologist Earl Campbell, who runs a Big Island research laboratory for the U.S. Department of Agriculture, said the noise levels of dense populations reach 80 to 90 decibels, comparable to loud truck noises. Big Island real estate agents say the problem has become so acute that sellers must disclose if tree frogs live in the area along with vog and active lava. Adele Eggel, a Realtor with Clark Realty in Hilo, said a buyer recently requested to stand on the grounds of a property in Hawaiian Paradise Park subdivision near Keaau to see if there were any frogs. The frogs haven't affected home sale prices yet, "but maybe it would limit the buyer profile," Eggel said. "Some people would not prefer to live next to a bunch of roosters. Now we have people saying, 'I don't want to live next to a bunch of tree frogs.'" On Oahu, the coqui frog has been discovered in nurseries and garden shops. Home Depot in Iwilei has a population living in its parking lot, Matayoshi said. Home Depot Garden Department manager Barbara Evarts said the store is passing out fliers from the U.S. Fish and Wildlife Service to its employees and holding an informational class concerning them. Fifteen males have been caught at a Kahaluu nursery, but the population isn't growing as in Wahiawa, Gibson said. Since the females don't make as much noise, they're harder to catch, she said. A female can lay eight to 20 eggs in cuplike plants with a little water. Froglets hatch with no tadpole stage. "Now we have a real opportunity to prevent them from getting established on Oahu ... before it becomes like a mosquito or rat," said Joby Rohrer, a University of Hawaii biologist who works with the U.S. Army. He would like to see stricter shipping and quarantine regulations. "It's too bad the state doesn't have more clout because they're still exporting plants from the Big Island and Home Depot is still selling plants," Rohrer said. Souza has suggested that the Department of Agriculture alert garden shop customers with fliers. "The pest problem requires immediate action," Wong said. The state Departments of Agriculture and Land and Natural Resources asked the Environmental Protection Agency on June 1 for an exemption for an emergency use permit to use caffeine as a pesticide. Although Gibson regularly leads frog-hunting groups, she said, "Hand-capturing is not going to do it." In Wahiawa, the frogs are higher up in the trees. And the method would prove ineffective in highly infested areas where the problem is too large, Gibson said. To report a coqui frog, call the U.S. Fish and Wildlife Service at 541-3441.